The RX3000 provides an ideal platform for growers looking to reduce irrigation cost, and automate irrigation during frost events. Research has shown that automated irrigation for frost events can significantly reduce water use. An advantage of this system is the ability to plug and play additional sensors like rain and soil moisture. The optional relay output module gives the added ability to automatically turn on pumps, fans or sprinkler systems. The HOBO RX3000 system takes advantage of the latest web-enabled technology to remotely monitor sites and to notify growers of important events such as frost conditions. HOBOlink Software provides the remote access to data from any web browser, as well as the ability to remotely change system settings. The HOBO RX3000 system incorporates built-in 3g cellular communications. 3G cellular has the widest coverage, while a Wi-Fi version provides coverage where 3G is not available. The NEW HOBOnet Field Monitoring System provides a cost-effective and scalable solution for web-enabled monitoring of field conditions including Frost Alarming. Selecting the Wireless Temperature Sensor option above upgrades the system to include a wireless sensor and receiver capable of 600m wireless range. Extenders also available. Note: This removes the std wired Temperature sensor from the kit. 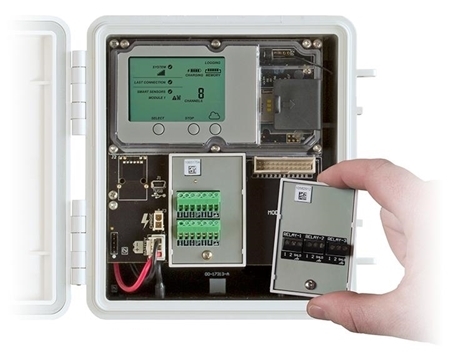 The basic configuration for frost alarms consists of the HOBO RX3000 station, a temperature sensor, and a user-supplied autostart controller. The autostart controller is needed to control the irrigation pumps during start-up, allowing the pumps time to prime which protects them from damage. A relay in the HOBO RX3000 is configured to activate the autostart controller when a frost condition occurs, and to deactivate it when the frost danger has passed. Typically the RX3000 is configured to activate irrigation at one temperature and turn it off at a higher temperature, to avoid short-cycling the irrigation system. For example, the RX3000 can be configured to turn on irrigation when the temperature drops below 1°C, and turn off irrigation at 2°C. Notifications can also be sent by email or SMS to one or more cell phones when the irrigation system is turned on or off, so growers can know immediately when a frost event is happening. There are several autostart controllers available. Some growers have used the Murphy ASM170 controller. The optional relay output of the RX3000 can be connected directly to the autostart's remote start/stop input. Be sure to use wire of sufficient gauge to handle the current to the relay and make sure it is UV rated for outside use. The autostart's documentation should indicate what wire gauge is required. 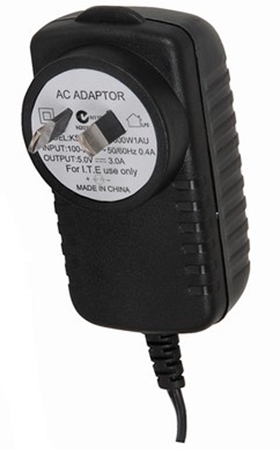 For example, the Murphy controller recommends using 18 AWG stranded wire. Also, double-check that the power through the relay will not exceed the (30V, 1A). It is a good idea to connect a 1A fuse in line with the relay. It is also important to know that the pumps at each site are actually working, so it is common to add a pressure sensor to the system. This allows the pump pressure to be monitored remotely via HOBOlink on the internet. This requires the HOBO RX3000 to have the optional 4-channel analog module p/n RXMOD-A1 installed. The 0 to 100 psi gauge pressure sensor (part number Jumo Midas) can be connected directly to the analog sensor port. This sensor has a 1/4-inch NPT fitting for connecting into the irrigation system water lines. Note that for frost alarms, it is best to use an exposed temperature sensor in the crop canopy, and to not put the sensor in a solar radiation shield. Although a radiation shield improves temperature measurement accuracy during the day, it slows the response of the temperature sensor during frost events. If daytime air temperatures are also needed, a second temperature sensor with an RS3 Solar Radiation Shield can be added. There are two ways that the HOBO RX3000 system can be used for irrigation management. One is to use soil moisture readings to automatically turn on irrigation when soil moisture levels get low, and the other is to use the RX3000 system to monitor a timer-based irrigation system. In the latter case, the grower uses the soil moisture data to verify that the desired soil moisture range is being obtained and then adjust the irrigation schedule as needed. In both cases, soil moisture sensors are used to measure the actual soil moisture in the crop root zone. In the first case, the RX3000 alarms are configured to activate the irrigation system when the soil moisture goes below the desired minimum, and to turn the system off when the soil moisture nears saturation. The set points depend on the soil type. Multiple soil moisture sensors can be deployed to get a better profile of soil moisture, and trigger irrigation if any area is too dry. Just as with frost alarms, a text-message notification can be sent when irrigation is turned on. This way the grower can go out to the site and do a visual inspection to verify that all the sprinkler heads are in fact working. It is not uncommon to have a clogged head. Soil moisture sensors can be deployed to automate irrigation based on soil moisture, or to allow growers to monitor soil moisture and optimize irrigation schedules. Better irrigation management not only saves water, but also reduces associated pumping costs such as fuel and maintenance. Using less water also reduces stormwater runoff, which reduces the chances of negative impacts on the environment. In some cases, the filters in irrigation system lines can become clogged with debris, and need to be cleaned in order to maintain the proper pressure in the lines to the sprinkler heads. By adding a second pressure sensor to the RX3000 system, it is easy to remotely monitor the filters, and see when filters need to be cleaned. This is done by connecting a pressure sensor to the lines on either side of a filter. When there is a large pressure drop across the filter, that means it needs to be cleaned. The RX3000 analog module has inputs for connecting pressure sensors. Service Plan Recommendation - For frost alarm applications, we recommend a 10-minute update rate plan, which provides real-time viewing of conditions during frost events, a time when conditions can be changing quickly. 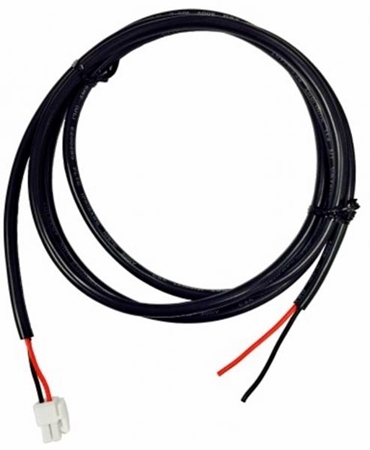 In selecting cables for connecting the pressure sensor or relay output, the cable diameter should ideally be 4.0 mm (0.157"). If a larger cable is needed, then the RX3000 should be ordered with the 10-input option, because that includes an opening for running cables that are 6.4 mm (0.25") in diameter.